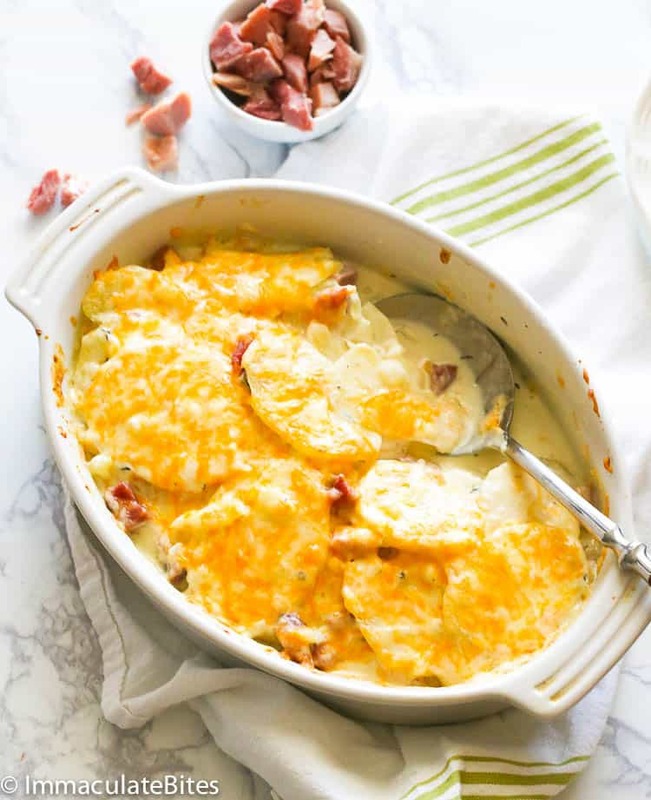 Scalloped Potatoes and Ham – cheesy, creamy, filling and family-approved casserole dish loaded with warm and comforting flavors in a delicious white sauce. Another great recipe for your leftover ham! I can’t exactly tell you how AMAZING this dish is and always will be. 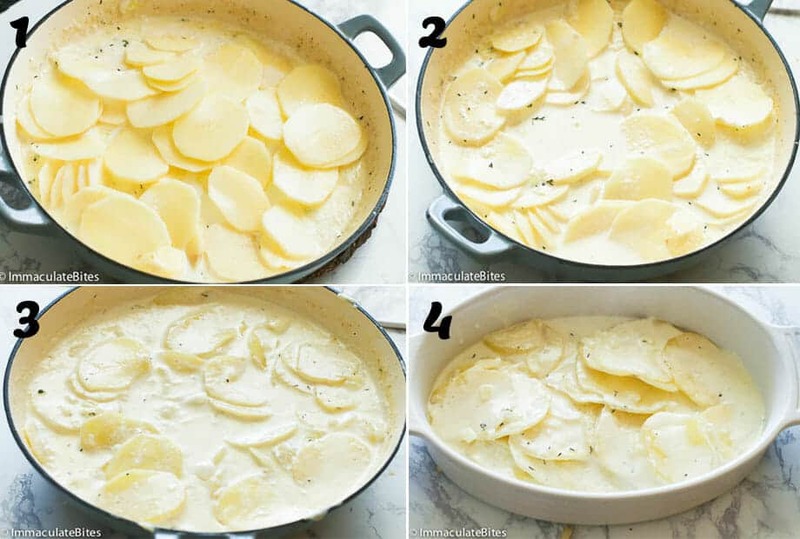 Scalloped Potatoes is one of my top comfort food which I could easily whip up in a heartbeat. Oh yes! But this time, I’m putting a wonderful twist to our favorite classic potato recipe just in time for the Easter. 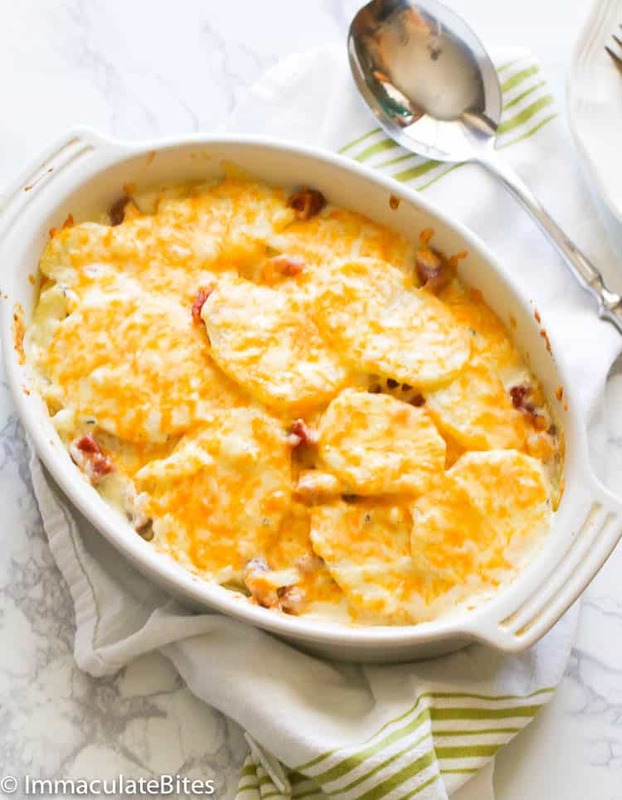 Introducing – Scalloped Potatoes and Ham! If you haven’t check around the blog, I actually do have a ton of potato recipes. But of all the potato side dishes that I’ve tried from Roasted Garlic Mashed Potatoes to Oven Roasted Red Potatoes, nothing compares to that comforting slices of buttery tender potatoes soaked in a delicious creamy white sauce topped with melted cheese. Yum Yum! 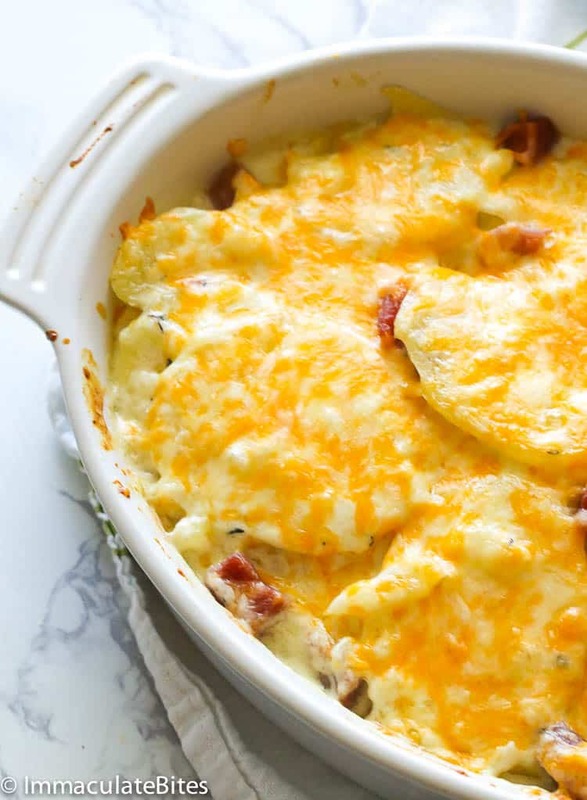 Scalloped Potatoes is a casserole dish with layers of sliced round potatoes and baked in a creamy aromatic sauce and topped with grated cheese. It has nothing but pure comfort in every serving. Scalloped potatoes are usually served as a side dish during the holidays. But as for me, this pretty works any day of the year! Russet potatoes have always been the best choice for me when it comes to scalloped potatoes. They are starchy and lends the creamiest scalloped potatoes. Starch is the key in this recipe which helps the cream to thicken up into a velvety sauce. Yukon Golds are also a great substitute for Russet although that would make your sauce more like of a milky one. 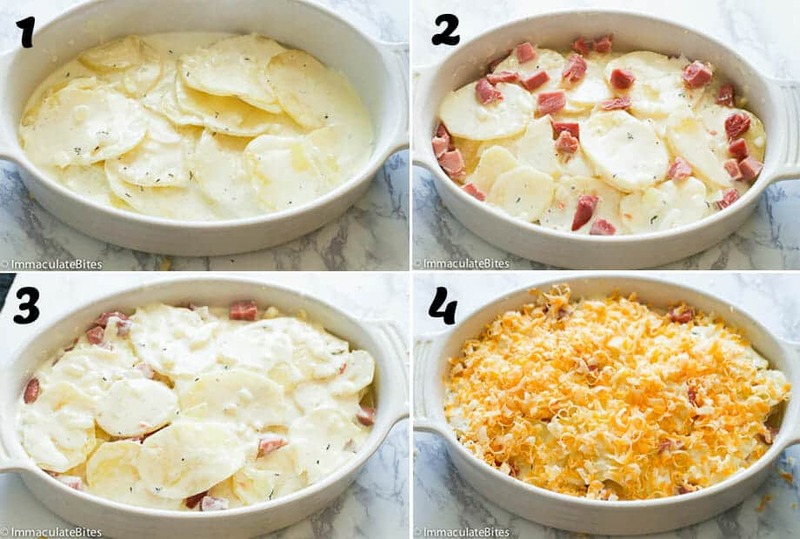 How Do You Make Scalloped Potatoes and Ham? 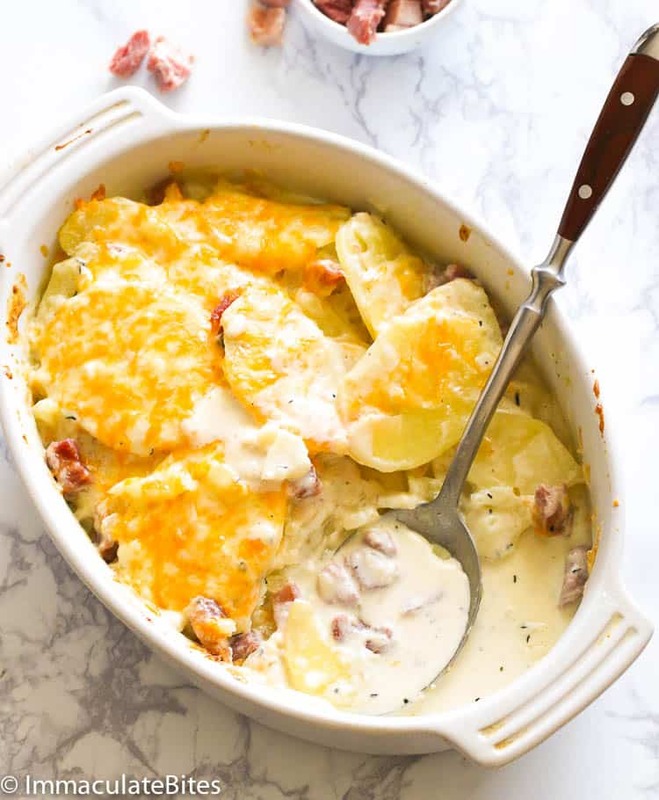 Although elegance are usually associated with complicated cooking methods, in this Scalloped Potatoes recipe, you’ll learn how simple it is to make without compromising all those wonderful flavors. I start off by making my white sauce with all those herbs and spices and cream. And since I like my potatoes to be flavorful as well, I simmered it to a few minutes in the same skillet instead of just layering cold cuts of potatoes in the casserole. Simmering the potatoes with the sauce allows us to get all the ingredients warmed up at the same time before we pop them in the oven for even cooking. Aside from that, this also ensures us a fairly liquidy sauce in between potato layers even after the dish is baked. I don’t want my Scalloped Potatoes to be on the dry side. After simmering the potato slices, you can now scoop them out gently onto the casserole while distributing the sauce properly. Top it with cooked or a leftover diced ham and then cover it with cheese. You may also add enough cheese while making the cream sauce. Now you’re ready to wait them bubbly and cheesy and oh-so-filling! Want to go over a little overboard? Sneak in some veggies into the casserole like diced cauliflower or thin cuts of zucchini and trick the kids to eat them. 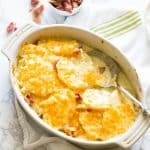 What To Serve With Scalloped Potatoes and Ham? This is such a remarkable versatile dish. If you don’t like any ham or bacon in it, you can omit it and serve it as a wonderful side dish or on its own. But usually, Scalloped Potatoes and Ham are served alongside with steamed veggies or sauteed green beans. 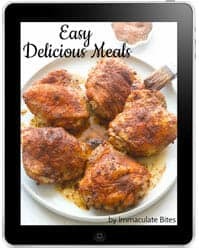 For a meaty meal during the holidays, you can serve this casserole dish with Oven Baked Pork Chops, Pan Seared Oven Roasted Steak and even your favorite Easter Glazed Ham. Oh, YES! Scalloped Potatoes is the perfect addition to any special celebration or holiday menu. It certainly pairs well with almost anything. Your guests and family would surely be impressed with this. Scalloped Potatoes are best enjoyed when warm. You can serve them immediately or keep it inside a warm oven for half an hour. To make this dish ahead, you can simply bake it as directed below, then allow it to cool down before you cover it tightly with a foil. Refrigerate for 3-5 days. When ready to serve, just pop it in the oven at 350 F and bake while covered with foil for about 30 minutes. To make this dish ahead without baking, assemble the casserole 6-8 hours in advance and refrigerate it until ready to bake. Add a splash of milk if needed. Use Russet potatoes for best results or Yukon Golds. Use a mandolin slicer for the potatoes to achieve even slices and cooking. Want to lighten it up a bit? Add some extra veggies in it like diced cauliflower or thinly sliced zucchini. If your scalloped potatoes are still hard, you might have sliced it too thickly and you’ll just need extra cooking time. If you notice that the top is already browning, carefully cover the dish with foil and cook it until potatoes are soft. Pre- heat oven to 350° F.
Preheat skillet, then add butter, followed by onions, garlic and thyme. Pour in cream, and milk followed by salt, pepper, and nutmeg. Bring the cream mixture to a boil and simmer over medium heat, stirring occasionally for about 5 minutes. Remove from heat and let it cool down a little. You may discard the onions and thyme (optional; use a sieve for this process). Transfer cream mixture in to a Dutch oven. Add sliced potatoes into the creamy mixture. Cover Dutch oven adjust, heat temperature to a simmer. Cook for about 10-15 minutes until potatoes are almost tender when pierced with fork. Then transfer to a baking dish, add ham in between layers, sprinkle with cheese and top with more ham, if desired. Bake until potato mixture is bubbling around sides and the top is golden brown. Let it cool, slightly before serving. If your scalloped potatoes are still hard, you might have sliced it too thickly and you'll just need extra cooking time. If you notice that the top is already browning, carefully cover the dish with foil and cook it until potatoes are soft. Pre- heat oven to 350° F. Preheat skillet, then add butter, followed by onions, garlic and thyme. Sauté for about a minute or more until fragrant. Be careful not to let the garlic burn. Pour in cream, and milk followed by salt, pepper, and nutmeg. Bring the cream mixture to a boil and simmer over medium heat, stirring occasionally for about 5 minutes. Remove from heat and let it cool down a little. You may discard the onions and thyme (optional; use a sieve for this process). Transfer cream mixture in to a Dutch oven. Add sliced potatoes into the creamy mixture. Cover Dutch oven adjust, heat temperature to a simmer. Cook for about 10-15 minutes until potatoes are almost tender when pierced with fork. Then transfer to a baking dish, add ham in between layers, sprinkle with cheese and top with more ham, if desired. Bake until potato mixture is bubbling around sides and the top is golden brown. Let it cool, slightly before serving.